Economics of Inclusiveness: Can We as a Society Afford Not to Provide Assistive Technology or Use Universal Design? We will look back at the beginning of the 21st Century, as the time when society began to have an enlightened appreciation for the uniqueness, limitations, and richness of the resources of our world – natural and human. We are beginning to recognize how the sustainability movement affects all aspects of our lives (and the lives of those to come). Moreover, we are beginning to appreciate the pivotal role that Universal Design can play in creating a sustainable society that cost effectively empowers all people in our society to maximize their potential. This appreciation, however, comes with a price – proof of the value that UD can play. Society is increasingly hesitant to commit resources for unfounded promises. Universal Design has always seemed like the right “moral” thing to do but does it really make sense from an economic/benefits standpoint? Evidence-Based Design is the tool that is providing the data that supports a positive answer to that question. The work discussed in this monograph lays the foundation for applying Evidence-Based Design to the field of Universal Design, justifying and guiding the efforts of researchers, practitioners, and users. The RERC-UD State of the Science Conference, held at the 2008 ICADI Conference in St Petersburg, FL, gave us not only the wealth of documented information presented in this monograph, but equally important, it brought together researchers and practitioners from around the world, providing them with intellectual and moral support and putting a face on the movement. Seeing the international similarities (and differences) has given us hope for a worldwide sustainability movement that has a human face. The international researchers, thinkers, architects, educators, practitioners and just plain people who are advocating Universal Design will find much support in this book. President - Universal Designers & Consultants, Inc. Whether called Universal Design, Inclusive Design, or Design for All, the movement advocating for greater accessibility in the built environment, product design, transportation and policy is gaining momentum. Universal design seeks to make life more usable, safer and healthier for a more diverse group of people, regardless of age, ability, or status. Its objective is to introduce higher levels of access and usability, within the constraints of affordability, in any environment, product, service, or policy. The Rehabilitation Engineering Research Center on Universal Design and the Built Environment (RERC-UD), funded by the National Institute on Disability and Rehabilitation Research (NIDRR), is the only federally funded research and development center whose mission is to study universal design in buildings and other environments. In February 2008, the RERC-UD held a State of the Science (SoS) Conference in St. Petersburg, Florida. Bringing together experts from around the world, the allday workshop explored the contributions of universal design to the independence and participation of individuals throughout their lifespan. With a focus on evidence-based practice, the conference reviewed current research methods and practice of universal design in housing, work environments, public spaces and the products and technology related to the use of these environments. It also explored new ways of conceptualizing universal design, how universal design can become part of the mainstream in practice, and the emerging market for it. This eBook showcases the papers presented at the SoS conference as well as additional noteworthy research efforts in this field. The eBook includes chapters by 24 well-established experts in the field. Steinfeld begins with an overview of current practices in universal design and how they can be improved to increase adoption of the concept in design and engineering disciplines. The chapter by Wylde and Hunter examines the emerging market for universal design and how builders and manufacturers should take advantage of the changing demographics caused by the aging population. Smith then describes the history and value of evidence-based practice and why universal design needs evidence to prove and direct its practice. In Chapters 4 and 5, Danford et al. and Steinfeld examine research conducted using case studies and human performance data. The authors describe the strengths and weaknesses of each research method and its applicability to universal design. Chapters 6 and 7 present an overview of the latest research on universal design in two critical domains: residential environments and workplace accommodations. Levine, Maisel and Milchus not only describe the most recent research, but also current design trends and areas where additional research is needed. 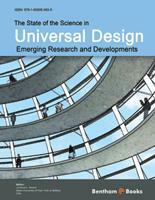 Chapters 8-13 provide a diverse cross-section of other research projects related to universal design. In Hsu et al., the authors report on their research study that examined the impact of cold and icy conditions on physiological and biomechanical responses. Fernie et al. specifically describe the impact of winter conditions on walking for vulnerable populations, including seniors and people with disabilities. Bruce not only explains the growing importance of informal learning environments as a place for people with disabilities to engage in social participation, but also the existence of barriers or facilitators to exhibit access for people with disabilities. Svensson describes the use of GIS-models to map and measure the spatial distribution of accessibility for impaired persons in seven Swedish cities. De Jonge and Schraner examine the cost-effectiveness of inclusionary design relative to existing exclusionary design practices. Whybrow et al. then outline the latest on universal design legislation, anthropometry and education in Southeast Asia. This chapter reveals the challenges of accessibility in developing countries and the role universal design can play in creating more inclusive communities in the developing world. The eBook concludes with a look to the future and an assessment of the research that is still needed to increase universal design’s implementation throughout the 21st century. While this eBook is not an exhaustive overview of universal design, it does cover a wide range of topics on the latest research and developments in the field. It will be a key resource on existing research, and present a framework for addressing unmet needs through future research and applications. I would like to thank Bentham Science Publishers, particularly Asma Ahmed, for their support and efforts. I must also thank IDeA Center staff members, Jonathan White and Heamchand Subryan, for their help editing the manuscript and designing the eBook cover, respectively. I also greatly appreciate the efforts of the authors and co-authors for their hard work, dedication and patience. I truly hope this eBook provides valuable information for a diverse audience, including designers, engineers, researchers, consumers and advocates. Carrie Bruce M.A., CCC-SLP, A.T.P.